[David Brown]’s entry for The Hackaday Prize is a design for a tool that normally exists only as an expensive piece of industrial equipment; out of the reach of normal experimenters, in other words. That tool is a 6-axis micro manipulator and is essentially a small robotic actuator that is capable of very small, very precise movements. It uses 3D printed parts and low-cost components. SLS Nylon Actuator Frame. Motor anchors to top right, moves the central pivot up and down to deflect the endpoints. The manipulator consists of six identical actuators, each consisting of a single piece of SLS 3D printed nylon with a custom PCB to control a motor and read positional feedback. The motor moves the central pivot point of the 3D printed assembly, which in turn deflects the entire piece by a small amount. By anchoring one point and attaching the other, a small amount of highly controllable movement can be achieved. Six actuators in total form a Gough-Stewart Platform for moving the toolhead. Interestingly, this 6-Axis Micro Manipulator is a sort of side project. [David] is interested in creating his own digital UV exposer, which requires using UV laser diodes with fiber optic pig tails attached. In an industrial setting these are created by empirically determining the optimal position of a fiber optic with regards to the laser diode by manipulating it with a micro manipulator, then holding it steady while it is cemented in place. Seeing a distinct lack of micro manipulators in anything outside of lab or industrial settings, and recognizing that there would be applications outside of his own needs, [David] resolved to build one. For those skeptical about the feasibility of Santa’s annual delivery schedule, here’s an autonomous piece of the puzzle that will bewilder even the most hard-hearted of non-believers. The folks over at the Center of Excellence Cognitive Interaction Technology (CITEC) in Germany have whipped together a fantastic demo featuring Santa’s extra pair of helping hands. In the two-and-a-half minute video, the robot executes a suite of impressive autonomous stocking-stuffing maneuvers: from recognizing the open hole in the stocking, to grasping specific candies from the cluster of goodies available. On the hardware-side, the arms appear to be a KUKA-variant, while on the software-side, the visualizations are being handled by the open source robot software ROS‘ RVIZ tool. If some of the props in the video look familiar, you’ll find that the researchers at CITEC have already explored some stellar perception, classification, and grasping of related research topics. Who knew this pair of hands would be so jolly to clock some overtime this holiday season? The entire video is set to a crisp computer-voiced jingle that serves as a sneaky summary of their approach to this project. Now, if only we could set these hands off to do our other dirty work…. [Justin] wrote in to tell us about the rover which his CalTech team has entered in NASA’s Exploration Robo-Ops Competition. Their time to shine is later this week, but you can see some of the test footage after the break. 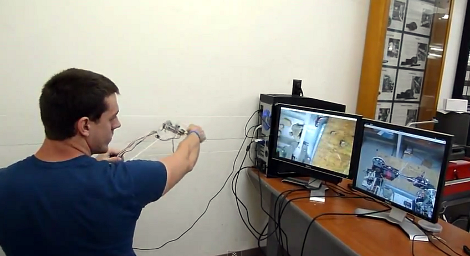 The operator pictured above is using a controller which is a scale model of the manipulator arm, with two cameras giving feedback. One of those monitors shows a feed from the arm itself, providing a view of the gripper. The other feed is a wide shot of the working area from the body of the robot. The arm has six degrees of freedom actuated by servo motors. The controller is a replica of the arm laser cut from acrylic. At each joint there’s a potentiometer whose value is used to establish the position of the frame. At first we thought that this would be more fatiguing and less convenient than using a gaming controller. But as we look at the dexterity of the arm it becomes obvious that joysticks and buttons would just make things more difficult.